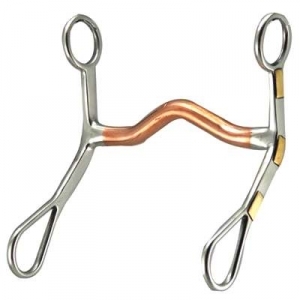 Here at HorseTackNow.com we offer Medium Curb Bit with Copper Mouths and many other horse bits. The copper mouth will also help with the horses salivation making it more convenient. This is a port curb bit that comes with a copper mouth. The shanks also have brass decorations making it look stunning on your horse. The size of this item is 12mm in the mouth and 3 3/4'' shanks. View the product image above to see the precise craftsmanship put into this bit.